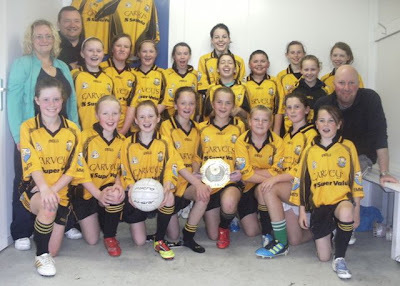 Emmets Ladies Football got a fine boost at the weekend where the U-12's captured the North Kerry Development Shield in Tralee on Sunday while Emmets Junior Ladies won the Novice County Championship in Killorglin. Emmets U12 Team had a great win over Abbeydorney on Sunday morning last after a great game where they won by a six point margin thanks to the hard defensive work by Brid Mason, Lorraine Nolan and Saoirse Kennedy. 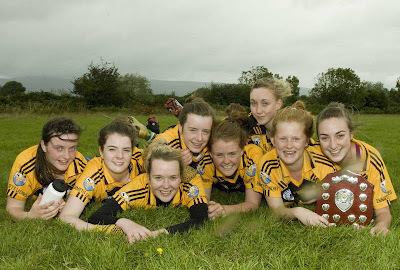 Captain Niamh Costello accepted the shield on behalf Emmets. While Emmets Junior Ladies were also crowned Novice County Championship on Sunday where they defeated Dromid on as scoreline of 9-6 to 5-4. 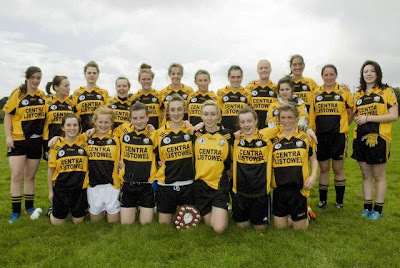 In a good game of attacking football Emmets excelled in all sectors of the field, with young guns Aoife Kennelly, Rebecca Horgan and Aoife Shine showing their true worth.